Based in Guatemala. Felipe is Maya K’iche’, a renowned spiritual leader and coordinator of Oxlajuj Ajpop (National Council for Mayan Spiritual Leaders). His work with this organisation, a Member of the ICCA Consortium, spans more than 20 years. He advises the Guatemalan Commission that deals with Sacred Sites— established after the end of the civil war that devastated Guatemala from 1960 to 1996—and the Sacred Natural Sites Initiative, another member of the Consortium. Felipe is an editor and author. Among his publications are the Agenda Socio-ambiental– Desde el pensamiento de los Indígenas Maya, Garífuna y Xinkas de Guatemala por los derechos de la Madre Tierra and a document on the governance, management and use of water in Guatemala. 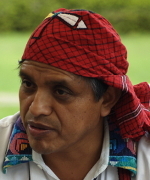 For the past few years, Felipe has been the Convener and Coordinator of the Comité Nacional Gobernanza del Territorio y Bienes Comunales (ICCAs Guatemala), whose goal is to gather into a unified group the genuine grassroots organizations that are fighting for autonomous governance of their ancestral territories.